It's that time of year again! Enter today for a chance to be listed among the Top 50 Systems Integrators in the commercial AV industry. The deadline for entry has been extended to Friday, November 6. Simply follow the survey link below, complete the necessary information, and you'll be on your way to being recognized among the top companies in commercial AV. The SCN Top 50 Systems Integrators list is based on each company's revenue for commercial AV system design and installation, as well as its total revenue for the current year. 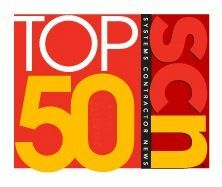 To be eligible for Top 50 consideration, a company's revenue for commercial AV system design and installation MUST account for over 50 percent of its total revenue. Fill our your entry survey here. The survey is open until October 30, so enter today to make sure you're among the top companies in the industry!If you have any questions pertaining to the list, please contact SCN associate editor Matt Pruznick.